Florida is a state that ranks on the top when it comes to expensive auto insurance premiums. But, there are also many ways in which you can manage to get cheap car insurance rates in the state of Florida. As you would know, the coverage premium varies within the state for different locations and also depends on your driving history. If you spend some time to choose the right type of insurance with the right discounts and deductibles, you can get auto insurance coverage for a considerable low rate and make major savings on your insurance premium in the long term. Florida state auto insurance coverage has a minimum requirement of $10,000 for Personal Injury Protection (PIP) and $10,000 for Personal Damage Liability (PDL) coverages. 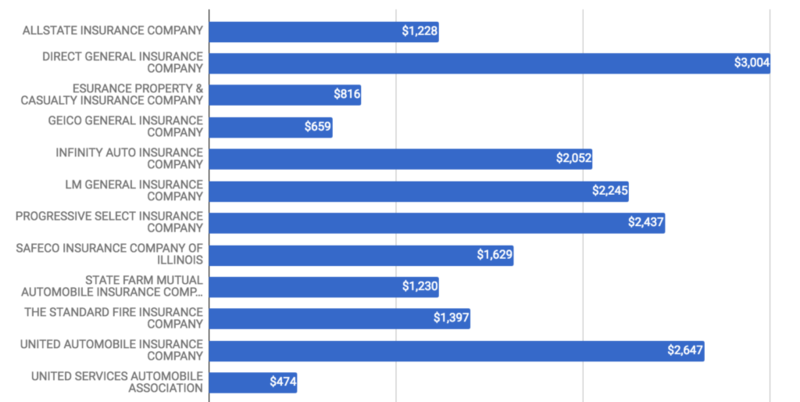 Now, let’s look at who offers the best coverages and lowest car insurance premium rates and how auto insurance premium varies in Florida by counties. This will give you an insight into the average cost of auto insurance premiums in your area. You could also submit the zip code of your location in the above form to get an online quote from our partner companies. It takes only a few minutes and you could find out exactly how much you could save, just by giving the necessary information. This case study handles the main topics as given below. The rates given are for the minimum requirements that is $10,000 for both PIP and PDL for a 26 year old female. The price may vary depending on many factors. Please get a quote to know how much it would cost to you. When it comes to auto insurance, you must know that choosing the cheapest option may not be the best option in the long term. The policies offered by different agencies will have its own perks and disadvantages. It is up to you to find the best car insurance that suits your need. 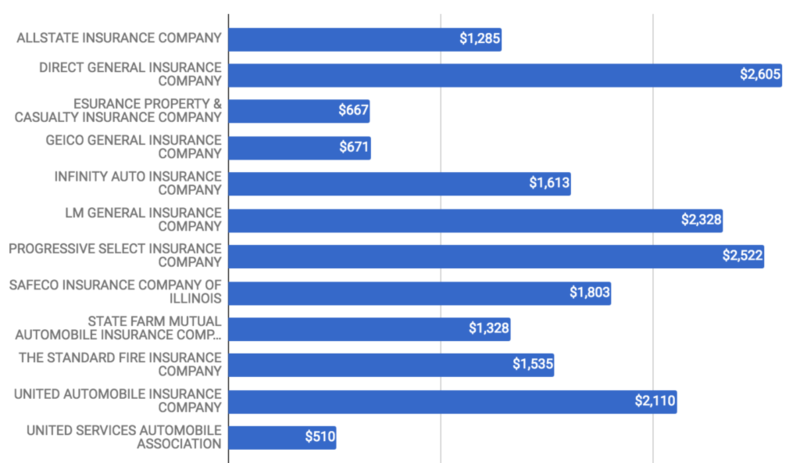 Looking at the total yearly premiums covered by different car insurance companies in Florida; Geico, Infinity Auto, Progressive and State Farm are the major players. USAA (United Services Automobile Association) offers the cheapest rates and has good reviews. But unfortunately, this is available only for military members and their families. Geico, Esurance, Allstate and State Farm have competitive pricing, so you will be able to find the cheapest premiums by one these providers. It is important to remember that the state average for car insurance premium comes around $1054. We have analyzed the car insurance rates over the 67 counties and have specified only the top 25 counties in detail. It is found that the auto insurance rates are high in the counties which have a high population and a high number of vehicles registrations. This means that the more the number of vehicles, the higher the chances of accidents and the higher the insurance rates will be. There are also many other factors which car insurance companies consider when it comes to premium. 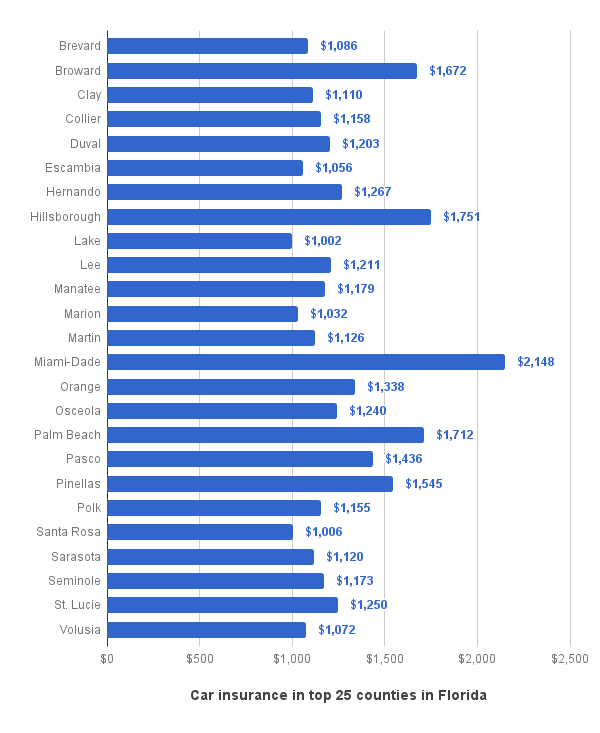 The counties with the highest rates for insurance are Miami-Dade, Hillsborough, Palm beach as shown in the table below. You can also see how that insurance rates are relative to the number of vehicles registered and the number of accidents. This gives you a good idea on how your insurance rates are calculated and why they differ so much from area to area. This county has the highest insurance rate in Florida and includes the cities of Miami, Homestead, Hialeah, Aventura, Florida city, FL and so on. The average insurance rate comes around $2148 which is almost twice the state average for auto insurance premium. 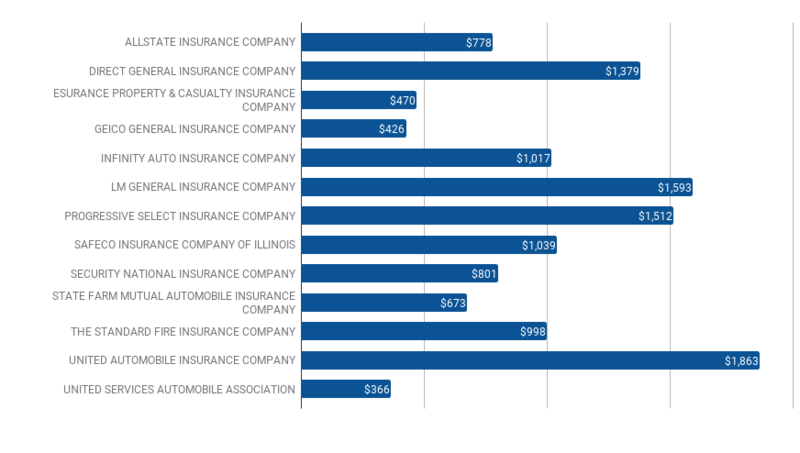 The insurance rates by different insurance companies are listed below. 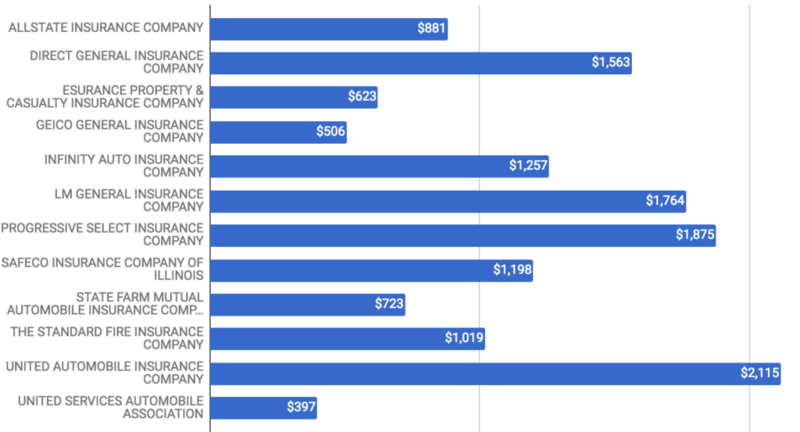 With USAA providing the lowest rate of $508 and Direct General Insurance got the highest rate of $4866. GEICO, Esurance and Infinity auto insurance company provide the most affordable auto insurance premium. The cities in the Hillsborough county include Tampa, Temple Terrace, Balm and Plant city. The insurance rate is this county is on the higher side at an average of $1751. UNITED SERVICES AUTOMOBILE ASSOCIATION providing the lowest rate of $471 and United Automobile Insurance has the highest rates at $4869. GEICO, Esurance and ALLSTATE provide affordable rates. West Palm Beach, FL is the most crowded city in Palm Beach County. The other main cities are Boca Raton, Boynton Beach, Delray Beach and Wellington. The average insurance rate is $1712. GEICO, Esurance, Allstate, State Farm and USAA provides the lowest car insurance rates in Palm Beach. The lowest car insurance premiums in Broward County are offered by USAA, GEICO, Esurance and ALLSTATE. The USAA offers rates as low as $510. 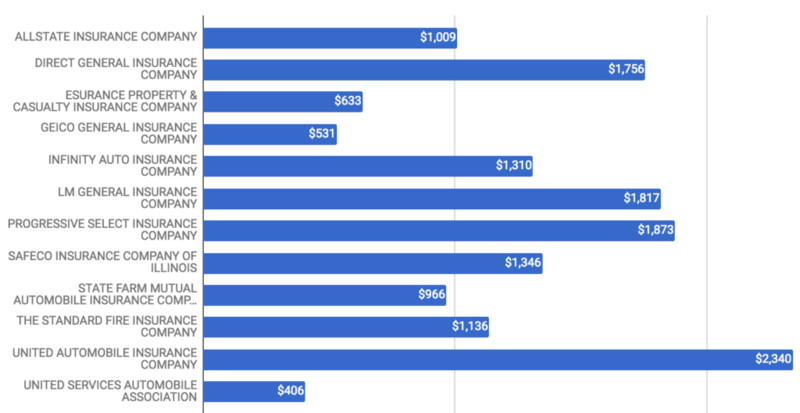 The lowest insurance rate in Pinellas County is $472 provided by USAA and other providers with affordable options are GEICO, Esurance and State Farm. 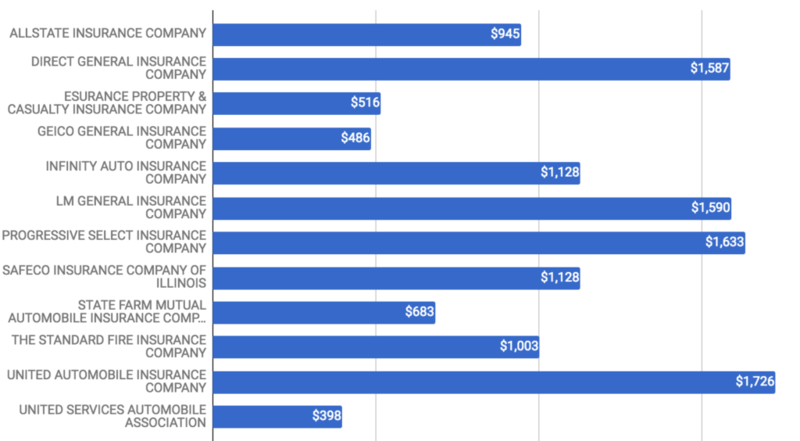 The lowest car insurance rates are offered by USAA, GEICO, Esurance and State Farm. While the Allstate, Progressive, Safeco and Liberty Mutual offers car insurance premiums at average rates. USAA provides car insurance at a competitive rate of $385 in Lee County. The other insurance companies also offer good rates. The number of crashes last year for this county was very low, which could be a major reason for low insurance rates. The most affordable car insurance premium providers in this county are USAA, GEICO, Esurance and State Farm. USAA offers premium rates as low as $398. Considering that car insurance can be very expensive. To be honest, most consumers would wish they never had to buy it, but in states like Florida, it is mandatory to have one form of auto insurance coverage or the other. But, to look on the brighter side, with a little research and planning, everyone has an opportunity to save on the car insurance expenditure by choosing the lowest premiums with the best coverage. Many people don’t realize that buying the appropriate coverage can save them money. It is important to know the in’s and out’s of car insurance to make the best out of it. For example, did you know that it would always cost you more to get your brand new car insured compared to renewing the coverage on a car that is a few years old? The first step towards determining this is having a good understanding of the various types of coverage available to drivers. For example, you can settle for comprehensive coverage if you are able to determine that in the case of an accident, you do not have enough savings to repair or replace your car and that of the other person involved in the accident. More so, if your car is older, the market value should be considered before opting for comprehensive coverage as you might not be able to collect benefits that would justify your insurance expenses. Choose wisely and you will be able to get the best deal and not have to overpay on your insurance. It is not unusual when people tend to stick with a specific amount of deductibles on their auto insurance coverage. However, when you boost your deductibles, you are invariably lowering the premium amount you incur annually. If you have a history of safe driving, you can increase your deductible to the highest amount possible and you may be able to save up to 40% on your car insurance premium. You will be able to save a lot of money on your insurance in the long run. This is another sure way of saving on auto or car insurance premiums. Apart from the fact that engaging in carpooling goes a long way to benefit our immediate environment, it also benefits your wallet. For example, if you come together with two or more persons in carpooling, with each person using the car in well-coordinated shifts, it will go a long way to reduce the mileage. Considering that most insurance firms track insured vehicles’ mileage, the less you drive, the more affordable your car insurance would be. A variety of researches have confirmed that with carpooling, you can reduce your mileage by over 75%. Mileage of 7,500 miles and below is considered the lowest and tagged as the “pleasure rate” while mileage of 13,000 miles is medium and anything higher, accrues higher insurance premiums. Depending on how often you and the other drivers use the car, you can save up to 25% or more on annual premiums. If you have been with a given insurance firm for a long time, it won’t be out of place for you to carry out checks to determine if you can get cheaper rates from other insurers, this is especially if you have maintained a clean driving record for a given number of years. All thanks to the internet, you don’t need to drive around town before you can make comparisons and review the rates you’ve been paying. There are sites that are dedicated to helping car owners compare rates online. You may be missing out on discounts and offers that could save you up to 10-20% on your existing premium. When it comes to saving money on car insurance, it is not just about finding cheaper premiums, it is more about finding reputable firms that won’t cut corners in order to make up for the cheaper rates you were offered. For example, an insurer that offers you annual premium of $1,400 in a state where the average is far higher than that might try to recoup losses by low-balling repair or replacement estimates in the case of an accident, collaborating with a repair shop to use inferior parts, or even increasing your premiums without any prior notice. On the other hand, a reputable firm would always make sure their clients’ claims are satisfactorily handled. Choosing the cheapest premium available to save 5-10% can be a costly decision in the long run. This can easily save you between 5%-20%. Yes, the type of car you use goes a long way to determine the rate you pay for your insurance premiums. A potential insurer would take into consideration how much it would cost to put your car back on the road should any form of damage occur, either through accident or natural occurrences like storms and flooding. If you have a very expensive car, then the premiums would surely be higher. This is why there are variations in premiums of auto models. You can always ask for premium quotes on potential car models. This would help you to make an informed decision when you are planning to buy a new car and will help you calculate future premium costs. Talk to your car dealer to know which car model can be most cost-effective when it comes to insurance. If you are not sure, you can always ask your insurer if they offer discounts on the above listed and more. You can get discounts ranging from 5%-30%. In order to make sure that the discounts are worth using a single-insurer, always remember to compare prices with other insurance companies. This is beneficial in situations where one of the factors that determine your premium rate is your credit score. With this being the case, you should always ensure that you maintain an excellent credit score. You should also carry out periodic checks to make sure there are no errors that would negatively impact on your credit score. There are exceptional cases where you can negotiate for a fair premium, especially if you just went through a divorce, suffered a job loss, or incurred high medical bills which in turn, drastically upturned your finances.